Alva Day probably parked his Model T Roadster beneath the power transformers for scale. 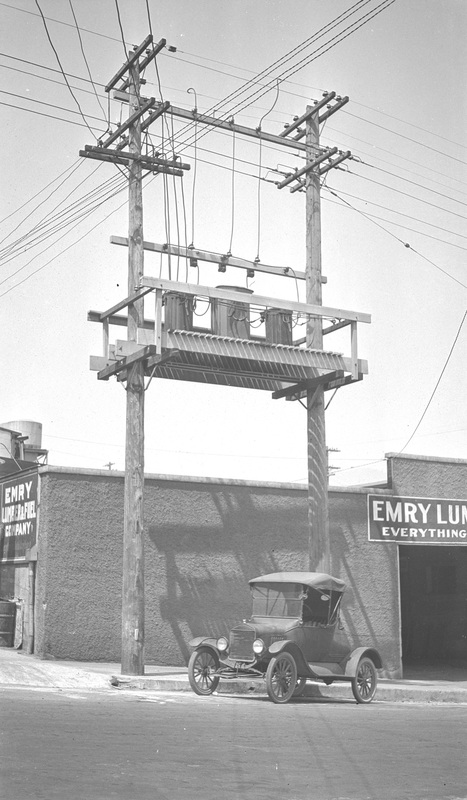 You can be sure the transformers were the photo subject, not the Emry Lumber Company. This is 4th Street, just above Cascade Avenue, now the location of a parking lot. It looks like those transformers live in that box now. I can't make out the license plate in detail, but it is from the 1920s. The automobile is an early 20's T.
What's remarkable is a early 1920's "plain Jane" Model-T roadster, would have cost under $300.00 back then. In 1925 the base Roadster price was $260.00! Which was first....the sidewalk or the utility poles?